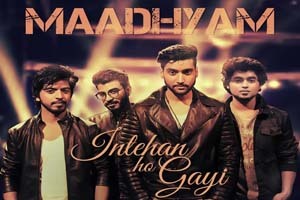 A melodious song recreated and sung by Mayank Maurya featuring Maadhyam - A Team. The video of this song is available on YouTube at the official channel Saregama GenY. This video is of 4 minutes 45 seconds duration. Lyrics of "Intehan Ho Gayi"
Lyrics in Hindi (Unicode) of "इम्तेहां हो गई"